Every day I do my rounds of the fields, looking to see what new flowers are springing up along with the insects and invertebrates that they inevitably bring. Yesterday I got back to the house, sat down with a cup of coffee and noticed this tick creeping its way along my arm. Fortunately it hadn't yet settled down for a meal! 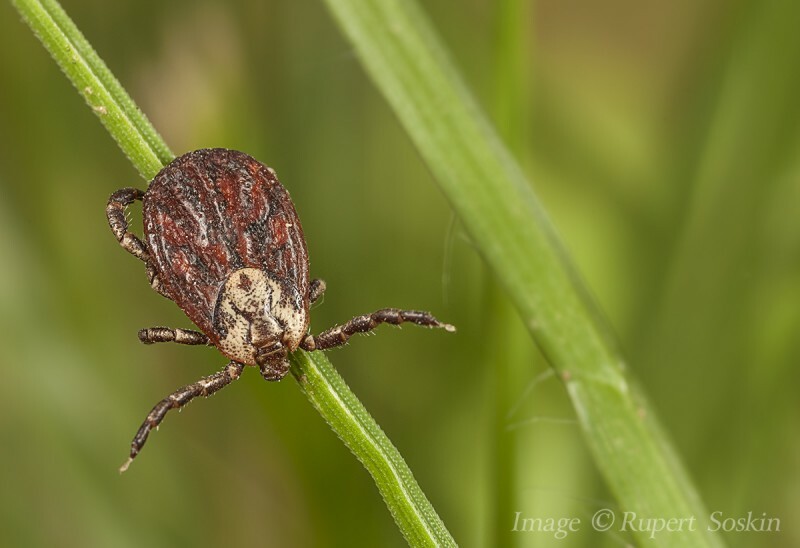 This species, Dermacentor marginatus, commonly known as the Ornate Sheep Tick, is remarkably unfussy when it comes to hosts, feeding on anything from horses and deer to dogs and humans. This one's last meal would most likely have been fox, boar or badger, those being my most frequent visitors. The question is where to put it now - I don't kill things, especially when I have photographed them. It just doesn't seem fair to take advantage of something and then flatten it!